For a while, I’ve wanted a chronograph watch, which is basically a watch with a stopwatch function used to measure elapsed time. I think using a smartphone for this is much easier, but to have the chronograph “complication” (a term for extra function) on a watch is pretty cool. 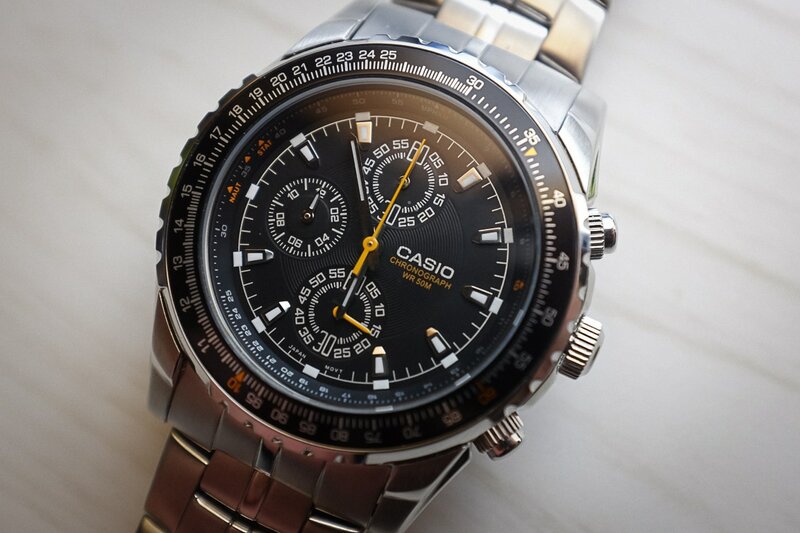 After a bit of online shopping, I found the Casio MTP4500D-AV chronograph watch with slide rule bezel. 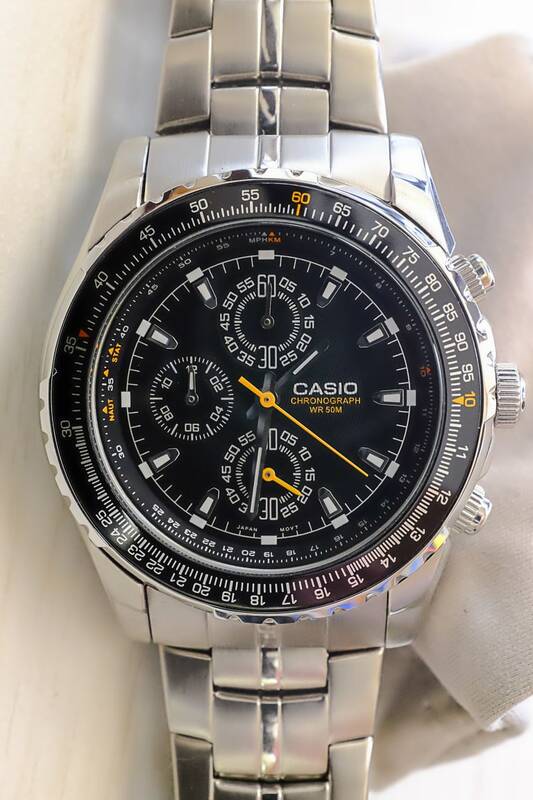 It looked pretty cool in the photos and I like Casio as a brand. 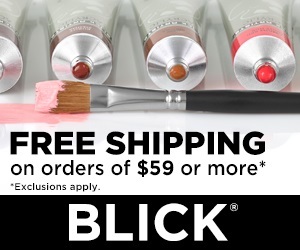 And the price was a bargain at US ~$35! The watch is 42mm in size, with a 22mm lug width, a stainless steel case and a quartz movement. You can compare the watch size next to the Seiko SKX007 and SNK809 in the last photo. The stainless steel bracelet feels good, especially at this price. As far as value goes, the watch is a winner. The main dial has the hours hand, the minutes hand, and the chronograph seconds hand. There are three smaller subdials, the one at the top is the chronograph minutes counter, the subdial at the left is the chronograph hours counter, and the subdial at the bottom is the watch seconds hand. 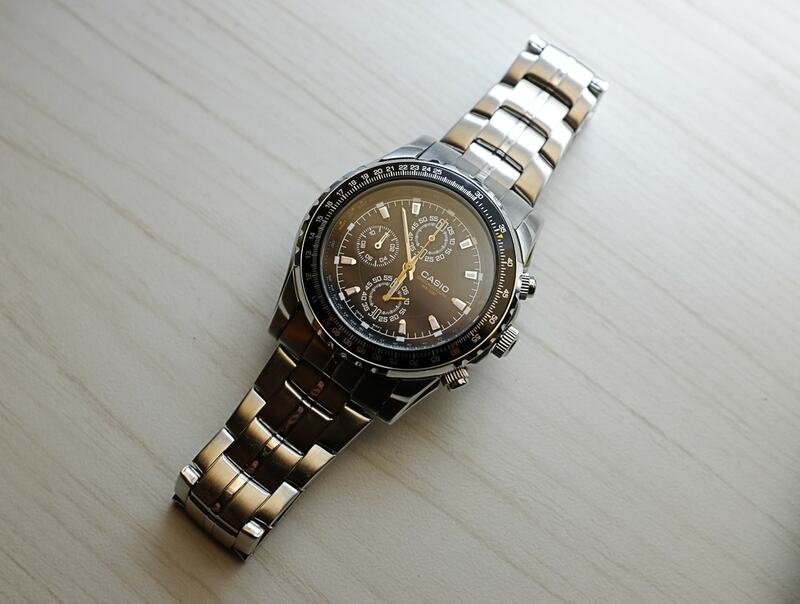 FYI, on most chronograph watches, the large second hand is used for the chronograph function, not the normal watch seconds. 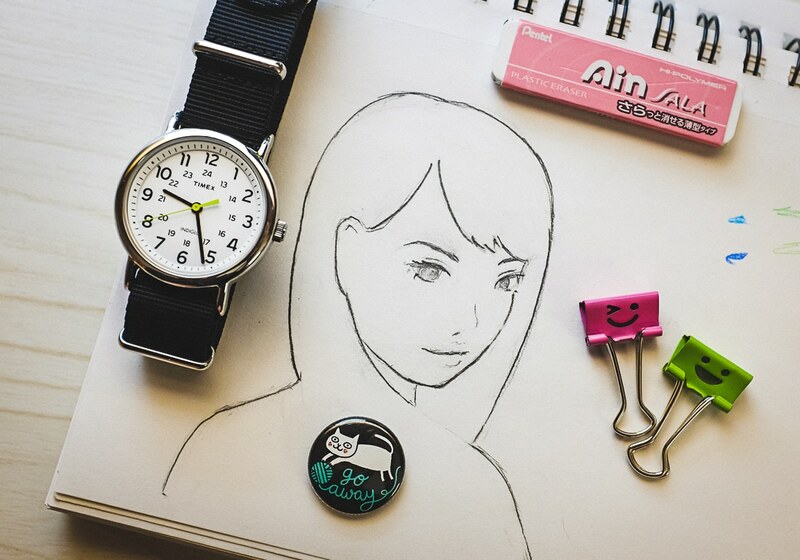 Operation of the chronograph is solid and simple. 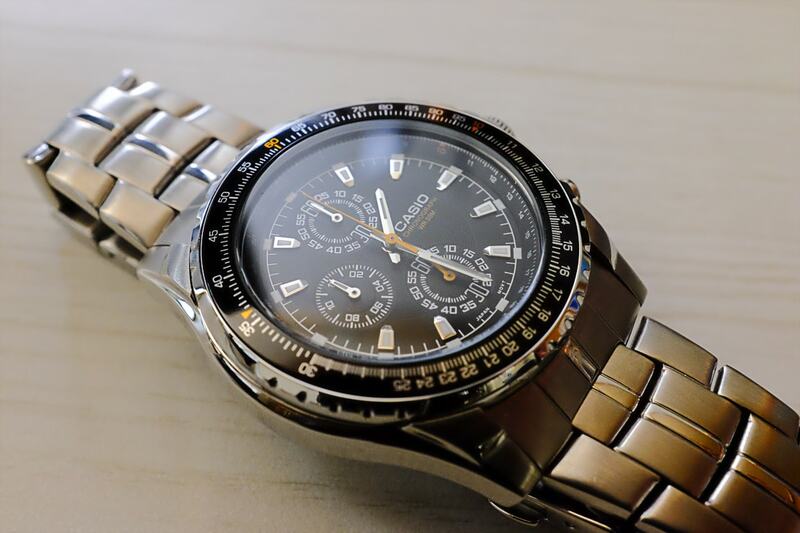 The top button starts and stops the chronograph with a nice solid click. The bottom button resets the hands. Then crown in the middle is used to adjust the time as you’d expect, and with it pulled out, you can use the chronograph button to set the chronograph’s start position in case it needs adjustment. 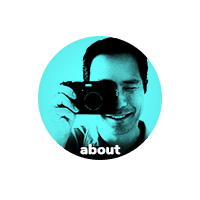 All-in-all, it functions smoothly and the hands line up perfectly. I had never used a slide-rule bezel before, so I thought it was kind of cool. I don’t really know how to use a slide rule, but I was able to convert miles to kilometers using it, so I know it’s at least functional. And the bi-directional bezel is smooth without any wiggle. Very nice! By the way, Long Island Watch has a great tutorial about how to use a slide rule bezel. I was so excited when the watch arrived in the mail, but upon opening it, my first thought was that this might not be a keeper. The polished, mirror-like finish is not really my style. It’s really shiny, so if you like shiny finishes, you’ll love this watch. The metal band has rounded edges which I don’t particularly like the look of. I thought that maybe putting it on a nato or plain black band would make me like the watch more, so I decided to give it a chance. I have to say, that the plain black band (see the last photo) went a long way to improving the look of the Casio, but I just cannot get past the shininess. 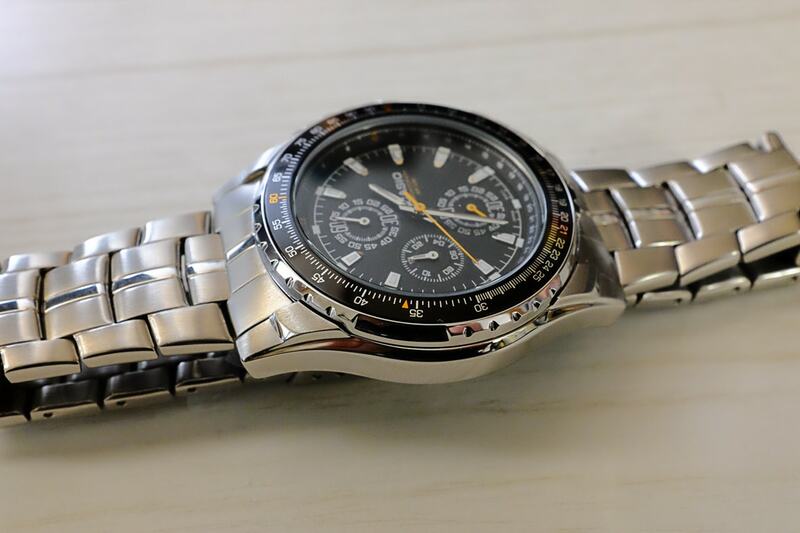 One other flaw (in my eyes) of the Casio MTP4500D-1AV is that the main minutes hand and hours hand is very reflective. It might be a cool design (they look like polished swords), but if you want to quickly know the time, it’s a terrible choice. On the black watch face, the hands are extrememly difficult to see unless they are reflecting something light colored. In my experience wearing the watch for a month, the hands are usually almost invisible and I have to angle my wrist in order to get a good reflection off of the hands to see them. Not good. The Casio MTP4500D-1AV is normally around US ~$50, but you can often find it on sale for US ~$35. 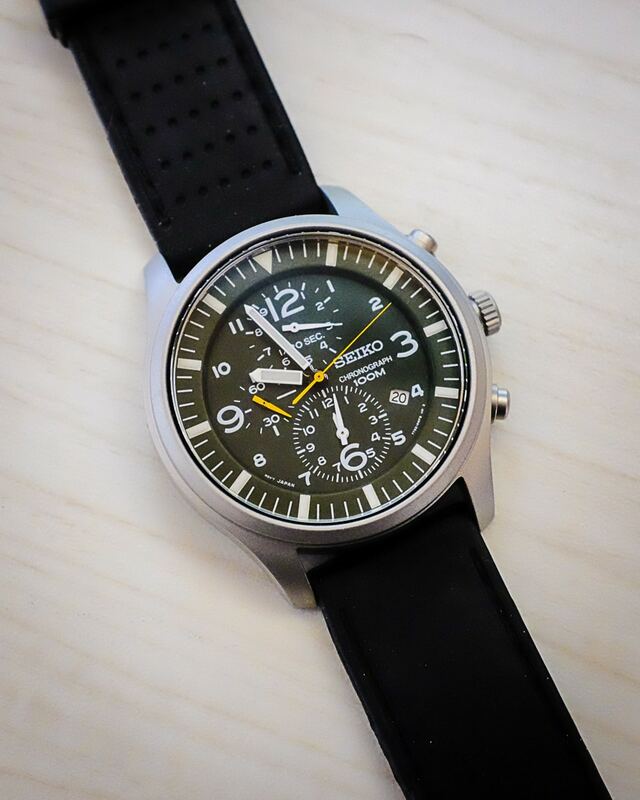 In conclusion, I think it’s a really nice chronograph watch for the price, but if you want an easier to read chronograph watch, I’d look elsewhere, such as at the Timex Expedition. 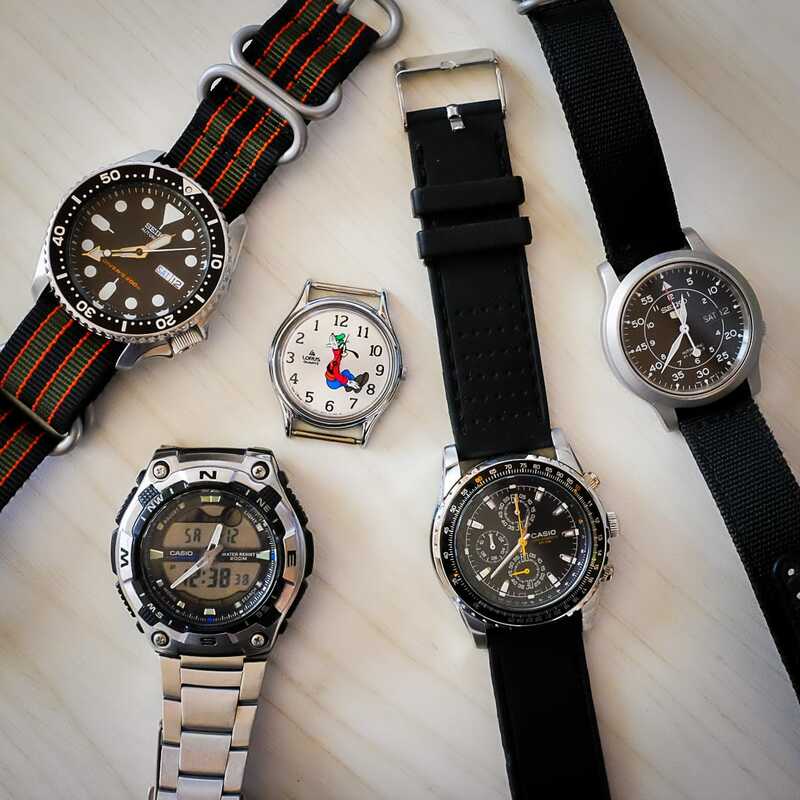 I was checking out some videos about the really cool Orient Triton watch today, when another video was recommended which was all about the Seiko SNK809. 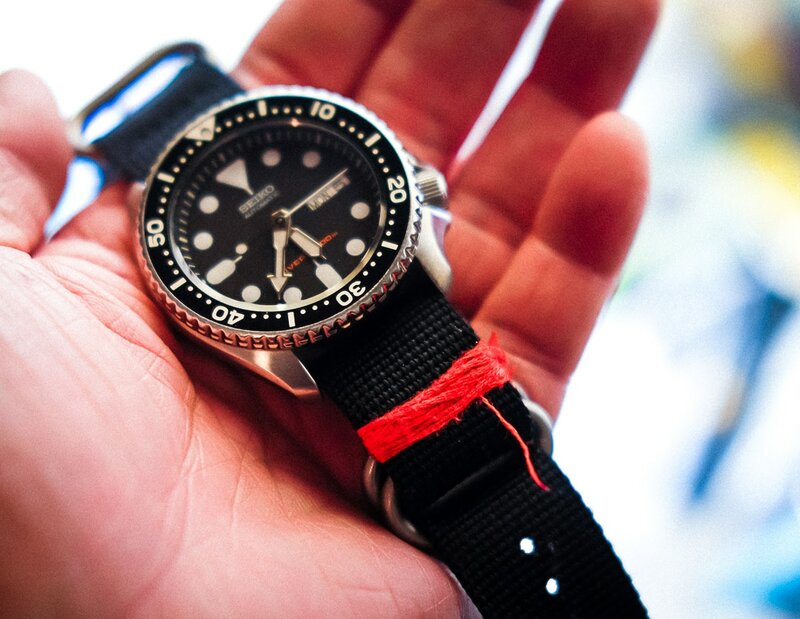 It got me interested in trying on the original black watchband that came with my Seiko, and when I replaced the band, I fell in love with it again. 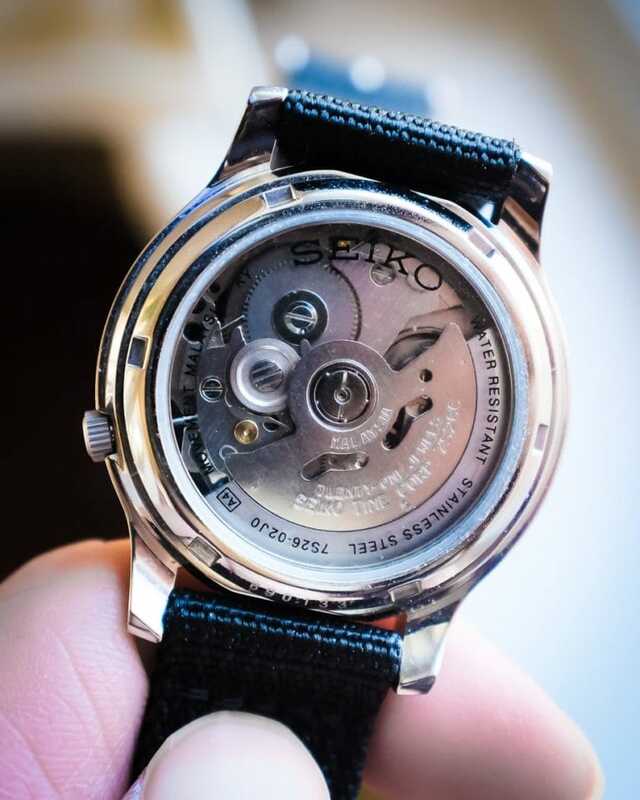 As much as I love NATO and ZULU bands, the Seiko SNK809 has a clear display back (so you can see the inner workings of the watch) and it’s a shame to have it covered by the NATO-style watch band. So, I went back to the conventional band and have been enjoying quite a bit. I also noticed that although I have lots of different color watch bands, I keep going back to plain black. I think it just looks so nice. Simple and clean on the wrist. 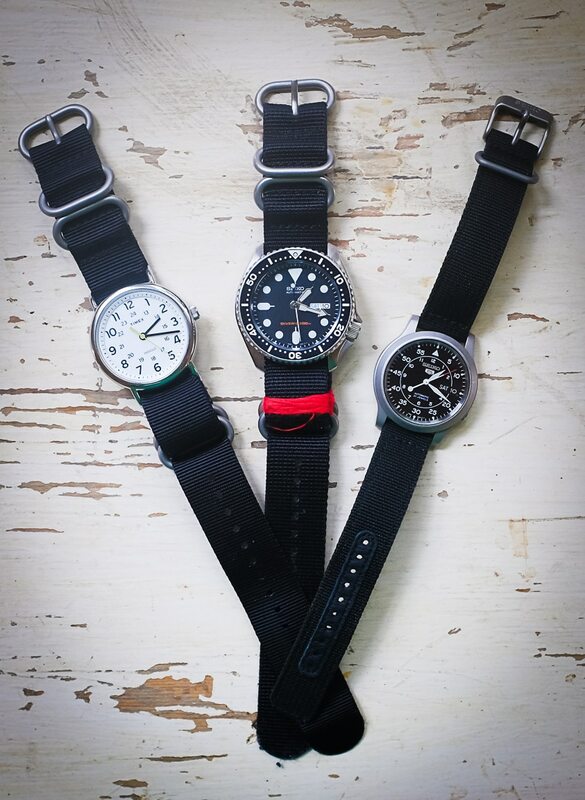 So, after trying out many bands, I have to say that a plain black nylon/canvas strap is what I like best.